On Sunday, April 27, two giants of Roman Catholicism will become saints at an unprecedented twin canonization astir with both joy and controversy: Popes John XXIII and John Paul II. While the media may focus on John Paul II’s perceived slow response during his pontificate to the sexual abuse crisis, fans of his wildly popular and influential Theology of the Body lectures (1979-1984) are ecstatic. 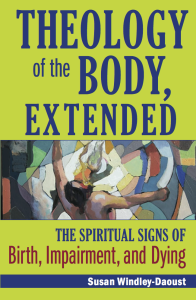 To celebrate this momentous occasion, Lectio Publishing announces the release of a new book, Theology of the Body, Extended: The Spiritual Signs of Birth, Impairment, and Dying by Dr. Susan Windley-Daoust. In this landmark book, the author honors the work of John Paul II’s popular and influential Theology of the Body lectures–a profoundly beautiful vision of human sexuality applied in the language of self-giving and fruitfulness–and extends it to the incarnate signs of giving birth, living with impairment and disability, and dying. In fact, this important book extends beyond “one of the boldest reconfigurations of Catholic theology in centuries” to explore how our creatureliness can respond to these states in communion with others and, above all, with God who actively invites us to fully hand ourselves over to Him in each case. This is true for persons subject to the events as well as those who accompany them through their experience. Answers Saint John Paul II’s call to extend his work to bodily experiences beyond sexuality. Details for the first time the spirituality of childbirth. Explores how the impaired communicate this language of self-giving and fruitfulness through their impaired bodies or minds. Treats the experience of dying as a sign that points to God. This book is defined by both its theological anthropology and spiritual theology. It touches the heart with a depth of spirituality that actually helps us to see the world as God desires us to see. The author, Susan Windley-Daoust, Ph.D., is Assistant Professor of Theology and Spiritual Director at Saint Mary’s University of Minnesota. She received her doctorate in theology from Vanderbilt University. She is the author of The Redeemed Image of God: Embodied Relations to the Unknown Divine, and has been published in Sojourners and America magazine among others. — Amos Yong, J. Rodman Williams Professor of Theology & Dean, School of Divinity, Regent University. To inquire about exam or desk copies, or textbook orders, call Linda Wolf (513) 677-3887. Preview Sample Copy (ePub download). This entry was posted in Published Books, Spirituality, Theology and tagged bereavement, childbirth, disability, dying, impairment, Saint John Paul II, Susan Windley-Daoust, Theology of the Body. Bookmark the permalink.